Topics in Anti-Cancer Research covers important advances in both experimental (pre-clinical) and clinical cancer research in drug development. The book series offers readers an insight into current and future therapeutic approaches for the prevention of different types of cancers, synthesis of new anti-cancer agents, new patented compounds, targets and agents for cancer therapy as well as recent molecular and gene therapy research. 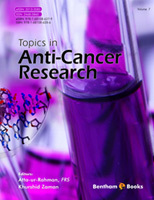 The topics covered in the seventh volume of this series include the role of inflammation in chemotherapy-induced neuromuscular effects, recent advances in nutrigenomics and relevant anti-cancer patents, nanocarriers for on-demand anti-cancer drug release, biochemical mechanisms that control autophagy for treating esophageal cancer, nano-formulations for cancer therapy and nanotaxol. The comprehensive range of themes covered will be beneficial to clinicians, cancer pro-fessionals, immunologists, and R&D experts looking for new anti-cancer targets and patents for the treatment of neoplasms, as well as varied approaches for cancer therapy. We are obliged to the authors for their contributions and to the reviewers for their com-prehensive comments for shaping up the chapters and improving their quality. We extend our thanks to Mr. Mahmood Alam, Mrs. Rafia Rehan and other colleagues for their cooperation in the finalization of this volume.